Hope this works .This is my layout so far ,am thinking of making it in two seperate pieces if i can .Question for the board is can it be done without noticing the join. As its a mountain scene . Just in case i ever have to transport it. Still woundering will i go for complete ply base and extruded foam to form hills and valleys or L type girder . Have a feeling i could shape foam easier with different levels and grades. Also how is track fixed to foam ? My favoured method is L-girder with Homasote track bed and foam scenery stuffed in the middle and hung from the track bed. I have one section where I used foam built up on a wood base, with foam roadbed. The whole thing was glued together with water based contact cement, even the track. But I don't have any turnouts on that part, so I didn't have to figure out mounting switch machines. And actually, most of my current layout is big sheets of Homasote on L-girder with foam scenery on top. Spider, are you open to discussion on your track plan? Well, it's always quite hard to disguise joints on modular layouts unless you "cover" them with buildings or other scenic devices. Let' say that a bit more tolerance is needed on this matter. On the trackplan side my opinion is taht there are too many parallel lines nut of course maybe that once "landscaped" things will look better. If one is willing to touch up the scenery after re-assembly, would it be possible to use non-adhesive caulking to "fill" the seam and cut through any track that crosses the seam with a very thin saw? For disassembly, you'd have to remove any buildings on the seam and cut the caulk. I am probably going to have that same "just in case I have to transport it" situation when I get started on my layout. thanks for your info people. As its my first ever layout am hoping to do it fairly right first time . And yes open to discussion on track plan. If i do decided to go for L typegirders what width of ply do i need for double track ? 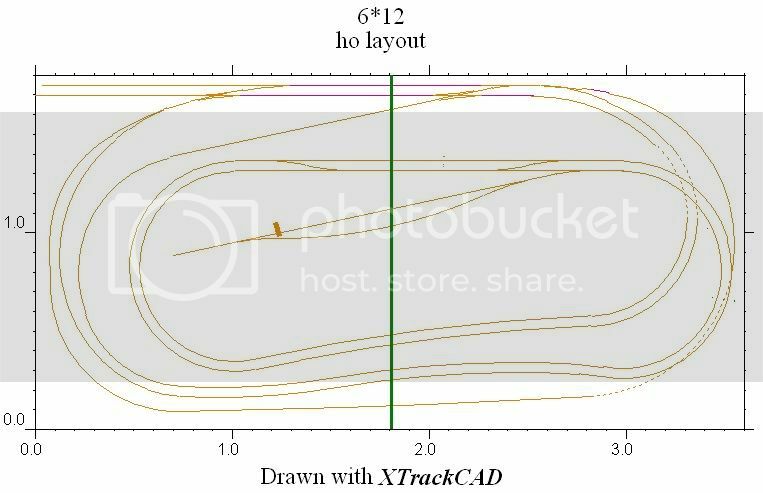 In HO, the standard track spacing is 2", so a double track needs at least 4", more on curves. Also there are considerations of whether you put trackside buildings on the same bit of ply or on something else. If the scenery will run upwards from the track, you might put a bit extra to support it. I don't really see how you are going to achieve much height in the linear space you have depicted in this track plan. You could achieve a sufficient overpass height if your grade were in the order of about 4-5%, but that is very steep, and will severely limit your locomotive's ability to trail much in the way of car 'tonnage'. Also, with your doubled track and such tight curves in the 'highland' area, you run the risk of stringlining or stalling altogether. Stringlining is the effect one sees when you lay a curve of wool or string and then pull one end. It will straighten first, and that is what happens to a hefty set of cars trying to please both gravity and the pull of a determined locomotive when both are on a severe grade that also happens to have a tight curve. Your curves are tight, particularly inboard of the higher ground trackage double main. I'm not suggesting you should give up on doubling anywhere; certainly you'll need a couple of head end locomotives if you are intent upon keeping your track plan with its apparently severe grades. But I am suggesting you might wish to simply have a couple of sidings, maybe 1.5 meters in length, and use them as a place to pass. 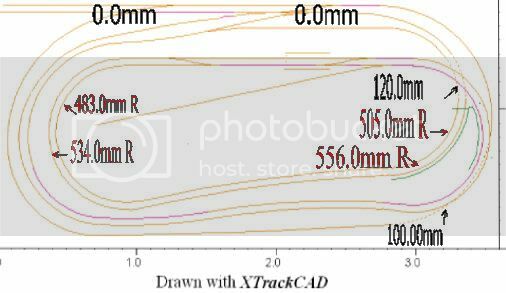 Keep them on the straightest portions of your track plan. Keep your major curves as wide as you can where the train will be working the hardest. Thanks for your comments selector . Having checked my layout again have found some things The second tunnel had only 60mm clearence have fixed that now at 100.0mm .Second tunnel at 120.0mm ok ,have kept all grades at 2% or lower.After checking what you said about radius have posted another pict ,they are too tight , Think i got carried away designing what i hoped would work rather than what will work. Well, if you've kept your grades at 2% you won't have any trouble, about radius it much depends from what type of power and how long will be your trains.